UPDATED: Tue., Sept. 25, 2018, 9:47 p.m.
PULLMAN – Easop Winston Jr. was still huffing and puffing as he strolled up to a group interview Tuesday afternoon following Washington State practice at Rogers Field. It feels like the junior wide receiver hasn’t stopped moving since he put on a Cougars uniform for the first time earlier this month. Last Friday in the second quarter against USC, Winston ran a crisp 10-yard post pattern to shed Trojans corner Greg Johnson before motoring into the end zone for a 28-yard touchdown. His route didn’t stop there. Winston dropped the ball and raced back across the end zone to find the 10 family members in the grandstand who’d traveled from the Bay Area to watch him play in Los Angeles. The dogged persistence Winston has shown his first season at WSU was also on display later in the game. In the fourth quarter, with the Cougars stationed on USC’s 4-yard line, Winston lined up at his “Z” position, off to the right of Gardner Minshew and about 5-10 yards in from the sideline. Minshew caught the snap, looked off multiple reads and scrambled toward the left sideline. Winston imitated his quarterback and trailed across the back of the end zone until Minshew spotted him. The QB finessed a short pass to the receiver, giving Winston his second touchdown of the game. It resembled so many of the plays the junior college transfer made – and touchdowns he scored – during spring camp, when Mike Leach regularly praised Winston for his improvisation and ability to extend plays. After catching his breath Tuesday, Winston gave a detailed examination of the touchdown to local reporters. The key, he said, was to keep running until he was squarely in Minshew’s line of vision. “First of all, when you’ve got a scramble, you design kind of the landmarks you want them to go, which I thought Easop did a very good job of because that’s exactly where he’s supposed to be,” Leach said. Winston is not leading the Cougars in total receptions or receiving yards this season, but he has the reign on another significant category: touchdown catches. The City College of San Francisco transfer is up to four through four games after getting into the end zone twice on Friday. He caught six passes for the second time in as many games and totaled 143 receiving yards to earn a spot on Pro Football Focus’ National Offensive Team of the Week. Somewhat to Winston’s dismay at the time, WSU coaches decided to spend a redshirt season on the JC transfer in 2017. 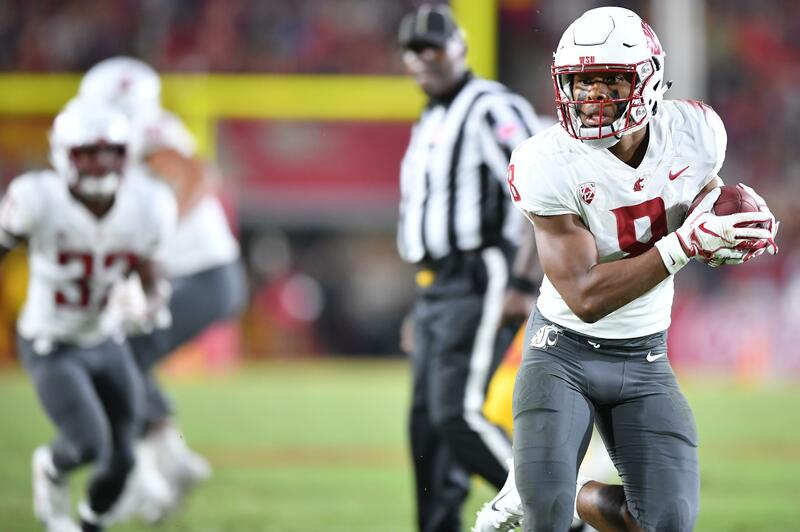 The Cougars were well-stocked at the outside receiver positions with Tavares Martin Jr. and Isaiah Johnson-Mack still on campus, and Winston, they felt, would benefit from a full season in WSU’s strength and conditioning program. The production the Cougars are getting from Winston these days made it well worth the wait. He scored in his collegiate debut against Wyoming and he’s caught 18 passes for 212 yards through just one-third of his redshirt junior season. “Man, I see the benefits of that definitely this year so it worked out for me well,” Winston said. And it’s hard to imagine WSU’s breakout receiver will stop moving anytime soon. Published: Sept. 25, 2018, 9:27 p.m. Updated: Sept. 25, 2018, 9:47 p.m.